A remake of a Steve McQueen movie from thirty years earlier, the 1988 version of The Blob boasts some gruesome special effects but otherwise finds it hard to justify its existence. What looks like a meteor crash-lands into a forested area outside the small town of Arborville, California. A red gooey substance oozes out of the pod and starts to devour the local residents. 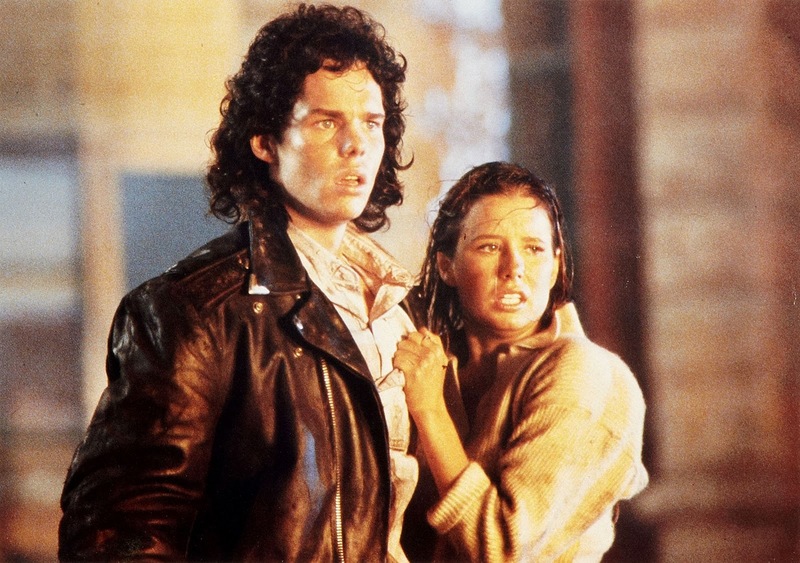 Brian (Kevin Dillon), the local long-haired teenager from the wrong side of the tracks, teams up with wholesome cheerleader Meg (Shawnee Smith) to battle the blob, save their friends and family, and try to stop the carnage. Soon machine-gun wielding government men in hazard suits descend on the town to quarantine everyone, obtain samples from the blob, and hush-up the fiasco: the meteor was in fact a secret military satellite containing experimental germ warfare material, and the whole situation is a military screw-up. Brian and Meg have to not only battle the blob, but expose the conspiracy as well. Despite some hints of wit and a few comic winks, The Blob plays most of its cards seriously. So the film attempts, and generally fails, to create genuine tension from oozing Jello that seems to change properties, size, and speed depending on the scene, and that can kill by suffocating, dismembering, or mangling, just for variety. Director Chuck Russell delivers a reasonably professional movie with tight pacing and standard thrills, but he gets little traction from characters firmly entrenched in a single dimension, with all expressions, lines and personalities borrowed from other movies. Brian and Meg are generally unappealing main characters, both Kevin Dillon and Shawnee Smith operating within a narrow range of acting talent. The best moments are reserved for Meg' young brother Kevin, who against his mother's wishes conspires to watch a horror movie with his best friend Eddie on the night that the blob makes its grand entrance to the town's main street. We only see snippets of it, but the movie that Kevin and Eddie attend appeared to offer better entertainment than The Blob.